A recent trip to Japan offered an excellent opportunity to create photographic appreciations of the wonderful motorcycles at the Honda Collection Hall at Motegi Twin Rings race track. Nearly all stemmed from the Honda racing history, with a few non-racers for historic purposes. Many of the bikes on display are racing versions of familiar street bikes, but ones that I never realized had racing pedigrees. The collection spanned from 50cc to 1000cc, from the 1950's to current technology. I emphasized earlier machines, mostly because more engine details are exposed to the eye. The Honda people were very welcoming, but my shooting ground rules only allowed a digital camera, a small tripod, one off-camera flash and a couple of background/reflector cloths. Also, no stepping over the display rails. Well, maybe they saw me push that a little and were too kind to make an issue of it. The Honda Collection Hall also contains their automotive racing vehicles. It's huge; however, getting to Motegi is not very convenient. If you want to go, check on the Internet, then contact me and I'll add some helpful details and a correction regarding getting there from Tokyo. Also included here is one bike that I ran across in a trendy clothing shop in Mito. The manager cleared up a shooting space and let me have a go at it. This was very generous and the exercise allowed me to identify a damaged piece of photo equipment before the big day at Motegi. Next time you are in Mito, drop by "Liquid" and buy a motorcycle tee shirt. I bought the Triumph Speed Triple one. 1954 Honda R125. 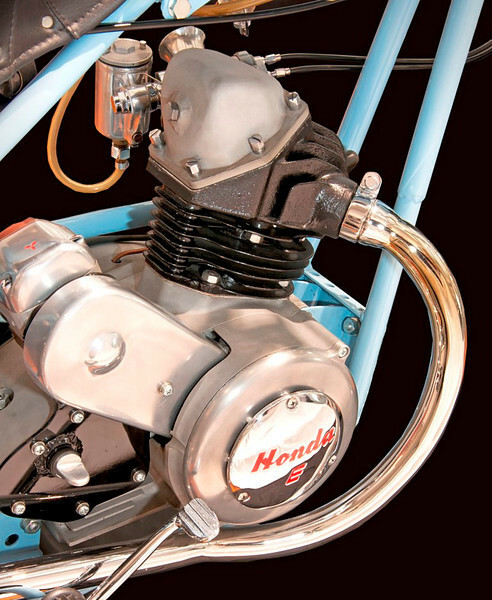 This "E-type" 4-stroke engine was Honda's first to contest internationally, appearing in a road race in Brazil. It boasted a single OHC, was air cooled, and only had a 2-speed transmission. (Honda Collection Hall).